Place Tostitos Scoops! tortilla chips on a cookie sheet, filling each with refried beans and leaving a small indentation in each centre. In a small bowl, combine eggs and cheese and spoon evenly into scoops. Bake until cooked, about 5 minutes. 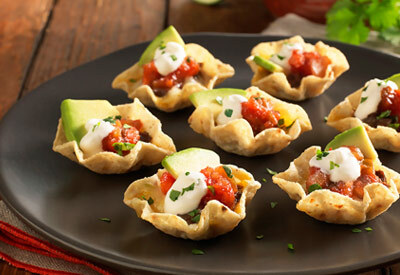 Remove from oven, then top each with salsa, a slice of avocado, a dollop of sour cream and cilantro. Arrange on a plate with slices of fresh lime and serve immediately.